HiCollage – we make traditional collage more simple, more fun, and more powerful. This is a must-have collage with over 10,000 possible layouts, and support up to 12 photos!!! It's also extremely easy, just pick photos you want, and we do it for you instantly! 【Over 10,000 variations】pick from 1-12 photos and we arrange for you! If you don't like the current layout, just tap next to see more variations, or tap back to go back to the previous style. We support full-size and Instagram-style collage frames. You can change borders as well as background colors. 【InfoBox】add more style to your collage by combining with our one-of-a-kind InfoBox! You can choose from 54 InfoBox designs- location, weather, maps, restaurant, or feelings – to color up your collage layout! 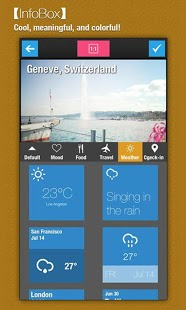 Some InfoBox are editable, and you can change from over 40 colorful InfoBox backgrounds. 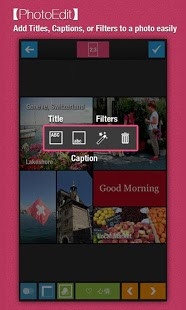 【Photo-edit】add Titles, Captions, or apply Filters by tapping on each photo, it's that easy! Titles or captions are great ways to add context to your collage. 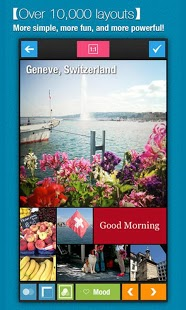 Press-hold the photo to switch position with other photos.